Teenage years are an important time in spiritual, social, and moral development. 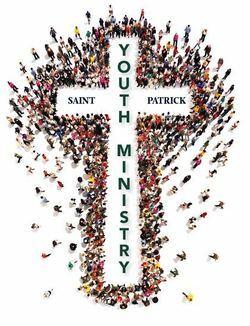 St. Patrick Youth Ministry reaches out to support these growing values for youth in grades six through twelve in faith-filled, enriching ways that are interesting, fun, practical, and real. Youth Ministry activities and events are held each month throughout the year at various times and dates. Activities are totally S.S.S. oriented ~ Social, Service, and Spiritual. These gatherings are a great place to introduce Christ to old friends, meet new friends, have a great time, grab some food, and learn how Jesus Christ can make a positive difference in your life. IS FOR ALL YOUTH OF THE PARISH IN GRADES 6-12. AND THOSE INTEGRATED INTO THE PUBLIC SCHOOL SYSTEM. 6th grade joins youth ministry after December of their 6th grade year! we prayer for our Youth. and to serve with youthful zeal. and to share Your message. in the life and mission of our Church. We the youth are not the church of the future. We are the church today. We learn how to walk in the foot steps of Jesus and be DISCIPLES TODAY! Learn to live out the gospel message as we serve others in the community. We strive to serve the Church, serve one another, and serve in leadership to the Junior High Youth program. WE STRIVE TO BE DISCIPLES NOW!